According to The Pulse Of Radio, ALTER BRIDGE and TREMONTI guitarist Mark Tremonti said in a recent interview on "The Jasta Show" podcast that both his current bands have not been able to reach the same large audiences as his previous act, CREED, because neither band has landed a massive hit like that group did during its heyday. 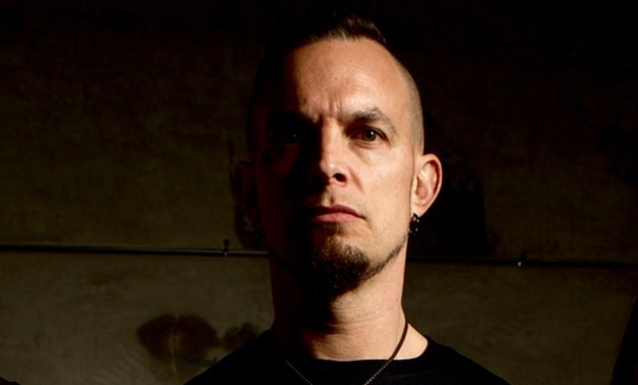 Tremonti explained: "One massive song and you've got your foot in the door... Both ALTER BRIDGE and TREMONTI, we haven't had that one song. We've had all the songs that our fans love and all albums that our fans love, but we don't have a big hit song." He added, "So when you're getting your haircut, it's, like, 'So what do you do for a living?' 'I'm a musician.' 'Really? What song?' 'Ah, you wouldn't know it.' [Laughs]." Tremonti also said he's cautious about releasing a track that is too "ballad-y" because it will give the wrong impression, citing a song called "Take You With Me" on the new TREMONTI album, "A Dying Machine". He said: "I told the record label, 'If I put it on the record to begin with, and then it's the first single for the record that I'm very proud of, and it skews everything because everybody thinks it's a pop record, I'm gonna be pissed.'" Mark told The Pulse Of Radio how he separates the songs he writes for ALTER BRIDGE, whose frontman is Myles Kennedy, and those he pens for TREMONTI, in which he sings lead. "You know, Myles is a big tenor singer and I'm a baritone-y kind of guy and that's what helps me make the stuff sound different," he said. "But when the stuff's on the table for me, between ALTER BRIDGE and TREMONTI, I just take what's best at the moment and run with it." Tremonti's solo band has been on the road recently behind "A Dying Machine", while ALTER BRIDGE is scheduled to return to the studio next spring.